In the past, Nissan has done a good job delivering the performance goods to its customers. In fact such a good job, arguably you could call Nissan – Japan’s performance automaker. Everything from the sporty and quick Altima to the muscular Maxima, has given Nissan a solid performance reputation. Now add to this, Nissan has in recent years brought back its Z car and released a new super-performance car – the GT-R, both of which offer a lot of horsepower and performance for the money. Nissan which began importing cars to the U.S. market back in 1958, started off very modestly with small inexpensive fuel efficient cars. Nissan chose to market these cars under the “Datsun” name which was replaced in the mid-1980s with the “Nissan” nameplate. Nissan first began its current trend in the performance market with the release of the 1970 Datsun 240Z, which was a genuine performance-oriented 2-seat sports car. The 240Z was beautifully styled; it was Japan’s version of the Jaguar XKE. The 240Z was an instant hit in the American market. The 240Z soon became the 260Z, then the 280Z and later the 280ZX. By 1984 a new 300ZX was released and it remained until its last year in the American market in 1996. After a brief hiatus the Z car was back in America with the 2003 350Z which was a new rendition of the Z car – having great modern styling and enough retro styling cues to please most Z car fans. It was what you would call – a perfect balance. For the 2009 model year an updated version of this car called the 370Z was released. 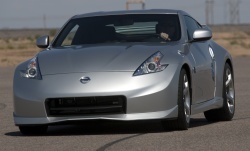 The current 2011 370Z is a very capable sports car with the perfect mix of power and handling. Years ago this type of car was considered a grand touring car. With a base price starting at around $31K, the 370Z is nicely positioned where even those on a tight budget can afford ownership. In performance jargon this equates to 332 horsepower and 270 lb-ft of torque which happens to be a lot of power for a car with a curb weight of only 3232 lbs – 0-60 mph comes in a very brief 5.1 seconds for the coupe (the convertible takes 5.5 seconds). In case this is not fast enough for you, the Nissan GT-R is Nissan’s version of hammering a nail with a sledge hammer. It produces 485 horsepower and comes at a base price of $84,060 – almost three times the price of the base 370Z. Of course your $84K is well spent on the GT-R with 0-60 mph arriving at an astounding 3.2 seconds, and the 1/4 mile at a whopping 11.4 seconds. The problem is that the GT-R’s price tag is beyond reach for most performance buyers. So as you can see there’s a real dilemma for performance buyers who gravitate to the Nissan camp. You either buy a 350Z coupe or convertible in the $30-$40K range or you go with the outlandish GT-R with a price in a much higher stratosphere. Fortunately Nissan has this covered with a 370Z offering which has more power and improved handling – the NISMO 370Z. Don’t let the “NISMO” name fool you; it may rhyme with the furry animal – Gizmo from the movie Gremlins – however this NISMO animal is a completely different breed. NISMO is Nissan’s Performance and Motorsports division which has done a fantastic job of whipping the already impressive 370Z into some serious shape. 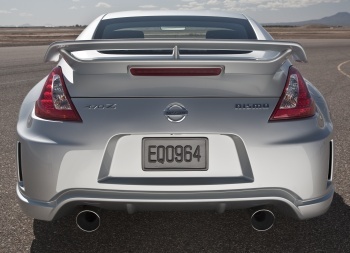 Where you thought the 370Z had plenty of punch, NISMO bumps horsepower up to 350, and torque to 276 lb-ft. This may not seem like a lot however the impact on acceleration is greater than you would think – the 0-60 mph time drops to 4.6 seconds. And the 1/4 mile for the NISMO drops to 13.5 seconds. The difference on paper for the NISMO is 18 horsepower and 6 lb-ft of torque more, yet a half of second is shaved off the 0-60 mph time. Call me a skeptic or a realist, but I think Nissan is underrating the NISMO’s true power output. Never-the-less, let’s just call it the best 18 horsepower increase you’ll ever feel. The NISMO’s extra boast of power comes from a free-flow H-configured exhaust system with free-flow mufflers and an optimized Engine Control Module (ECM). 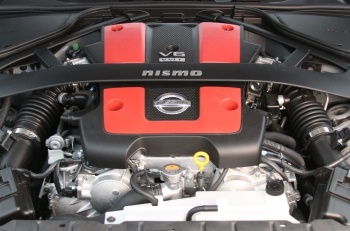 The ECM is the 370Z’s main computer, with the NISMO Nissan has tweaked the ECM for optimum power. What you have under the hood is Nissan’s reliable 3.7 liter (that’s 226 cubic inches for you old timers out there) DOHC 24 valves per cylinder V6. Back-in-the-day when 1 horsepower per-cubic-inch of displacement was extremely impressive, this little V6 makes about 1.5 horsepower per-cubic-inch – an even more impressive figure. The 3.7 liter V6 likes to rev, yet it has enough torque to give the impression of a much bigger motor. You can almost be fooled into thinking this engine is a V8, until you hear the unique sound of the high-performance V6. And when it comes time for filling the tank the V6’s mpg ratings of 18 city and 26 highway will be appreciated. The H-configured exhaust system has a better performance related tone than the standard 370Z’s exhaust system. However the big coffee can sized exhaust tips were once the bud of jokes not too long ago when modified imports first became popular – the NISMO has two very large coffee can sized exhaust tips. When first viewing them, I did have a funny smirk on my face; my first thought was that it would take an official NFL sized football in each exhaust tip to plug this exhaust system. However after a while they do grow on you, and when the seriousness of the rest of the NISMO package sets in the jumbo exhaust tips are easily tolerated. The NISMO only comes with one transmission choice – a close ratio 6-speed manual which is as smooth as glass. In fact it’s a joy running through the gears of this transmission. Even in stop-and-go traffic you almost don’t mind having to shift the gears manually. This transmission with its short precise throws was made for the oval track and a nice curvy road. And the shifter is positioned only a few inches from the steering wheel making it very convenient for those situations when lightning quick shifts are needed. The 6-speed has Nissan’s SynchroRev Match (SRM) which makes sure that the driveshaft always matches up with engine speed. What this means in layman’s terms is that every shift is precise in conditions such as downshifting where in the past the driver had to manually tap the throttle while shifting (to smooth out the transition to the new gear). SRM has you covered with always a smooth engagement of gears – no more bobbing forward or back during imprecise operation. The famous heel-and-toe maneuver which was needed in the past during shifting and braking where the driver’s right heel was used to apply throttle while his/her right toes were applying the brake is no longer needed with SRM. As you would expect the NISMO 370Z’s suspension has been tweaked. According to Nissan front spring rates have been stiffened 15% and rear spring rates 10% over the standard 370Z’s springs. The Front stabilizer bar has also been stiffened 15% and the rear stabilizer bar by a whopping 50%. Overall roll stiffness has been increased by 15% and the front damping is now 15% stiffer with the rear damping being 140% stiffer. The final result is a surefooted sports car which masters the turns – you can expect .93 g on the skidpad with the NISMO. Of course helping to keep the NISMO planted is a set of 19 x 9.5 inch and 19 x 10.5 inch wheels in the front and back respectively. The NISMO standard and only tires are the state-of-the-art Yokohama’s ADVAN Sport Y-rated high-performance tires – P245-40ZR19 tires in the front and even wider P285-35ZR19 tires in the back. Making these tires appear even wider than they are (especially the rears) – there are a set of Nissan’s five-spoke RAYS aluminum-alloy wheels. These wheels really accentuate the car’s character, even with all the flash the NISMO screams when first viewing it, the wheels are what catches your eyes first. And the NISMO 370Z stops well with its large 4-wheel disk brakes, the trek from 60-0 mph takes about 123 feet which is about average for a decent performance car these days however it falls short compared to many other performance cars. As an example a 2011 Ford Mustang GT can perform the same task in 109 feet, and the Mustang is at least 400 lbs heavier. If Nissan would knock off about 20 feet off the 0-60 mph distance, they could really make the NISMO stand out. Take a few steps back from the NISMO which only can be had in a coupe, and you can see this is no run of the mill 370Z. 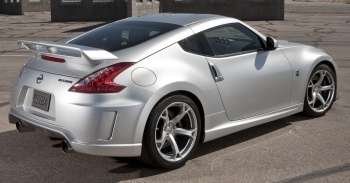 The 370Z is an attractive elegantly styled car like many of the former Z cars over the years. The NISMO model turns the 370Z into a street legal looking race car. It’s amazing what a few body panel changes and spoilers can do, but the final product is one very seriously looking car. Consider the 370Z as being like Michael Caine, what Nissan has done with the NISMO is to turn Michael Caine into Clint Eastwood. And just as it’s not wise to mess with Clint, you don’t mess with the NISMO. The wild rear spoiler makes Porsche’s 1980s vintage racing inspired whale tail look like a small add-on. And if you think the small rear window on the regular 370Z lacks rear visibility, try the NISMO, it makes you long for a return to that visibility since at least half of that visibility through the rear window is lost by the NISMO’s rear spoiler which feels like someone tacked on a large surfboard behind the rear window. The front-end has had a facelift over the 370Z – and the look personifies the “don’t mess with me” attitude – especially when you see the lower front spoiler which looks like it could slice your leg off if you walked in front of this car. Actually you can almost hear the car saying in Clint Eastwood’s voice “go ahead, make my day”. There’s also a lower air spoiler/dam that wraps around the entire car adding to the racing persona of this car. If you have not already guessed the NISMO looks and feels like it was grabbed right off a racetrack and dropped off at a Nissan dealership. However here’s where it gets real interesting, open up the driver-side door and then slide into the driver’s seat (however if you are over 6 feet tall beware a strong head tilt and body lean to the left is needed when entering the cabin to avoid banging your head against the side roof). Once in the driver’s seat the interior cannot be considered anything less than an oasis. The standard attractive cloth woven seats are comfortable; the dash is perfectly laid out. The steering wheel fits your hands like a glove and always seems to be in the perfect position. The shifter as mentioned before is so well placed. And for a bare-knuckle brawling sports car, it’s loaded with options and gizmos. And Nissan has managed to make this ultra-modern interior have a retro look that anyone who has owned a previous Z car, will easily recognize this as a Z car interior. Visibility out the front and side windows is very good for a sports car. The side mirrors make lane changing a breeze which is important since (as mentioned before) Laird Hamiliton’s surf board is blocking the rear window. Don’t let the wild rear wing and the coffee can sized exhaust tips fool you, the spoiler laden NISMO is no boy racer. It’s a serious sports car that fills a gap in Nissan’s product lineup. If you like the 370Z but want better acceleration and handling in a wilder package yet don’t have the extra scratch for the GT-R then the NISMO is just the ticket. 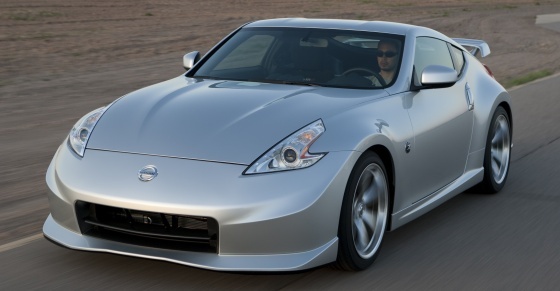 For a base price of $40,580 the NISMO 370Z is one great bargain for everything it offers. So if you ever had a hankering to own a fast street legal race car that won’t break your wallet, then you would be hard-pressed to find a better car than the NISMO 370Z.